Flatten chicken to 1/4 inch thickness; sprinkle both sides with salt and pepper. In a large non-stick skillet, brown chicken in olive oil and 2 teaspoons butter over medium heat for 5 – 7 minutes on each side or it is no longer pink inside. Remove chicken to a plate and cover with aluminum foil to keep warm. In the same skillet, whisk the lemon juice, parsley and mustard until blended. Whisk in broth; heat through. 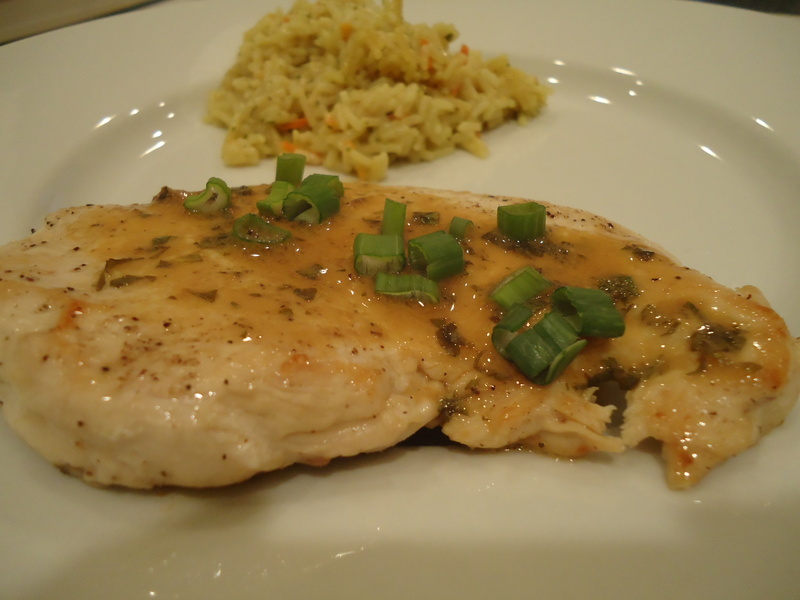 Place each chicken breast on a plate, spoon sauce over chicken and sprinkle some chopped green onions on top. This would be delicious served with steamed green beans and roasted potatoes. If you have any leftover pan sauce serve rice and use the sauce to moisten the rice. This entry was posted in Chicken, Company Worthy, Entrees, Sunday Dinner, Valentine's Day. Bookmark the permalink.